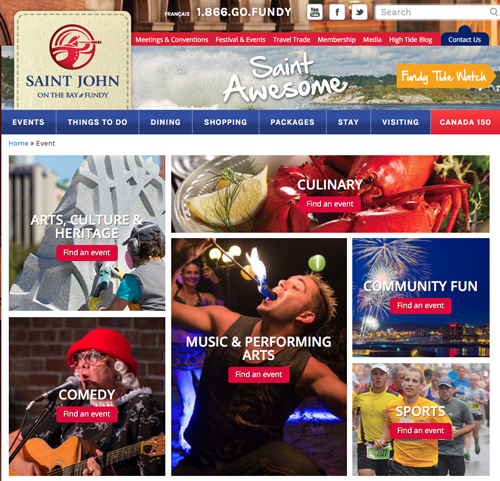 Click the pic to take you to the Discover Saint John Events Page. 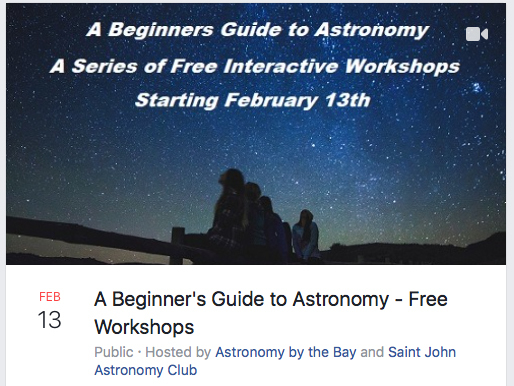 Hi~ I’m Chris Curwin of Astronomy by the Bay and I will be your host for this series of free, introductory workshops… “A Beginner’s Guide to Astronomy”. On my Live Feeds and at the eyepiece, I receive many great questions… what should I buy for a scope? What was in the morning sky today? These interactive and “hands on” workshops are designed to provide you with the answers you need to get started in this wonderful hobby. We’ll be encouraging you to ask any questions and hopefully you’ll complete these workshops with a much better understanding of the night sky and how to best take advantage of it. 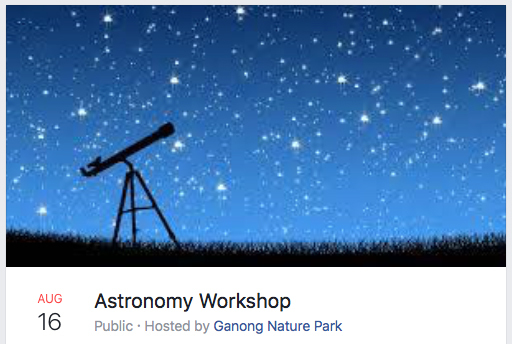 Week 1 will be “An introduction to the Night Sky”… our place in the cosmos, our Sun, Moon and Solar System, how things move in the sky, easy targets for beginners, how best to enjoy the sky and some tools and programs you can use. 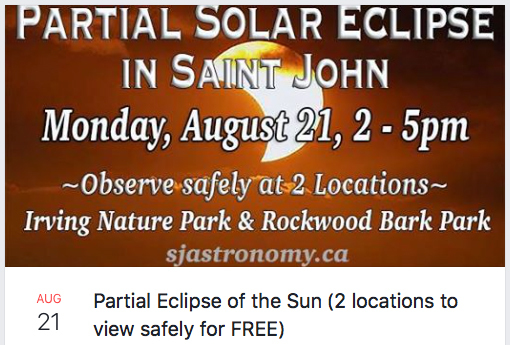 Week 2 will be on “Choosing the Right Equipment” with Saint John Astronomy Club’s Mike Powell. We’ll talk about what to buy in binoculars, telescopes and more… and we’ll have several scopes you can check out. 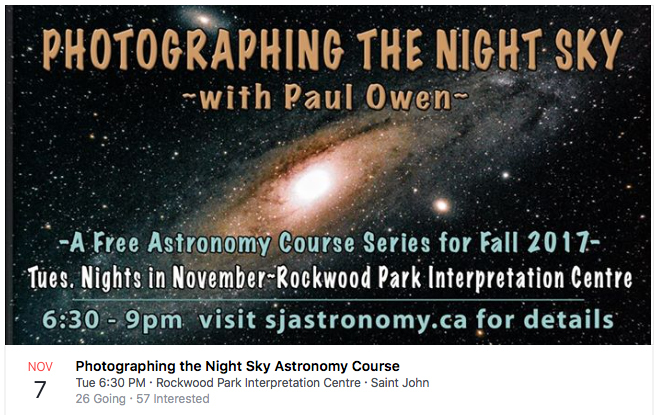 Week 3 will be about “Getting That Perfect Picture”, with Saint John Astronomy Club’s Paul Owen. We’ll talk about some tricks and techniques on using various types of cameras to get those perfect memories of night sky treasures… like the Moon, the Milky Way, and more. 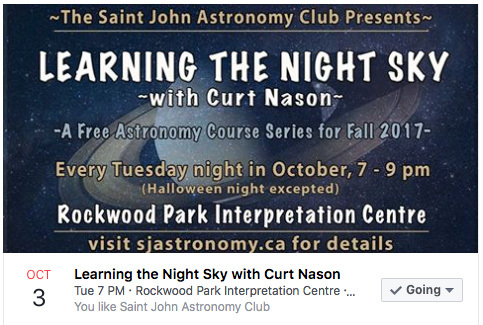 Week 4 will be on” Starhopping Through the Constellations”, with Saint John Astronomy Club’s Curt Nason. We’ll offer the best techniques on how to find those deep sky treasures using binoculars and small telescopes, We’ll also offer lots of folklore on the constellations and their meanings. Week 5 will be a wrap up and any additional topics. We’ll have a brief questionnaire on our first night. Your responses to the simple questionnaire will provide us with the content of our last workshop. We want you to leave with your questions answered, so we’re devoting this final workshop to your requests. I hope you can join us as we explore the night sky together. I request that you register for the workshops by sending me an email. Our workshop will be limited to 30 people due to space restrictions. I hope you can join us so we can help you be ready for the coming warm weather nights under the stars. –Visitors will be asked to park at Pijeboogwek and make their way on foot to the Visitor Center parking lot. Street lights will be turned off to allow an unimpeded view of the sky. –A park pass is required for all park users and can be purchased at Pijeboogwek (waxing hut) until 9 p.m. Free admission for youth 17 and under. –This activity is weather dependent. Please check back for updates before walking out the door. When: Sunday, January 20 @ 9pm to ? 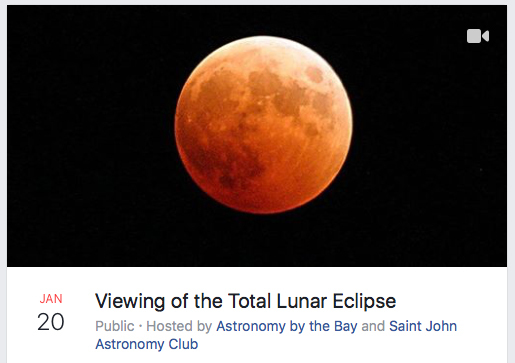 Please join us as members of the Saint John Astronomy Club present views of our Total Lunar Eclipse, in person and on a Live Feed, from beautiful Saints Rest Beach in Saint John (West), NB, just outside the Irving Nature Park. Club members will have telescopes set up for you to enjoy the view. We will spend time showing many other night sky objects before the main event. Night sky observing will start at 9pm, with a Live Feed beginning at 11pm. 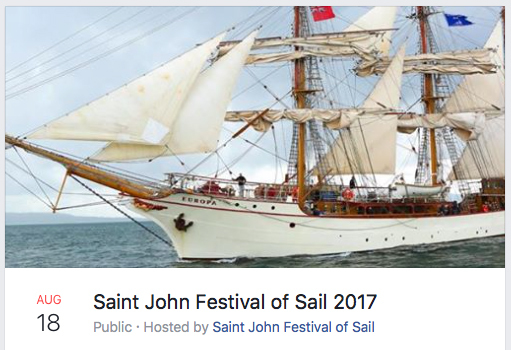 Note: Unfortunately, we were weather bombed out of the promising event due to a massive ice/snow storm that gripped Atlantic Canada. 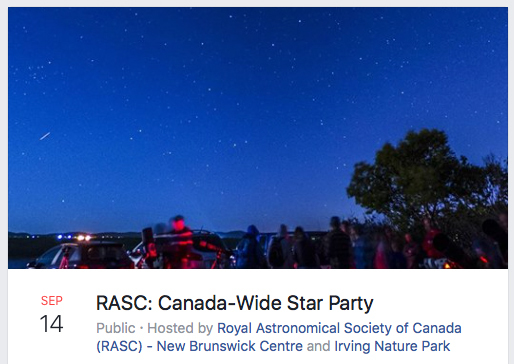 Join local members and guests of the Royal Astronomical Society of Canada for the second annual Canada-Wide Star Party. Mars, Jupiter, Saturn and the Moon will be the focus targets as twilight fades to darkness. Later we will visit the star clusters and nebulae of the Milky Way, the Andromeda Galaxy and its neighbours, the ever-popular ET cluster, and other gems of the night sky. -Please park in the lower lot by the Information Kiosk. -For overflow and people with mobility issues please use the lot near the Squirrel BBQ. Then meet at the upper parking lot (above Kiosk) near Squirrel BBQ. ~Don’t forget to bring a mug for hot chocolate, and bring an extra layer or two as the park can get chilly at this time of night. If it is cloudy we will try again on Saturday, September 15. ~All events are provided free of charge by J.D. Irving, Limited. If you have any questions please contact us at the park at 653-7367, by email or through Facebook. Registration for astronomers: is now available. 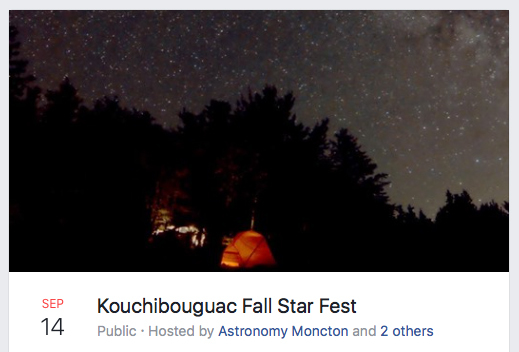 Come join members of the Royal Astronomical Society of Canada for our annual Fall Star Fest at Kouchibouguac National Park. Several telescopes will be set-up on Friday and Saturday nights, to allow the public to view the wonders of the night sky. Weather permitting, we’ll be able to see the Moon, the planets Saturn and Mars, as well as various star clusters, galaxies, and nebulae. •During Saturday afternoon, we’ll be at the Let’s Go Biking family event at La Source with our solar-filtered telescopes. Drop by to take a safe, close-up view of our nearest star, the sun. 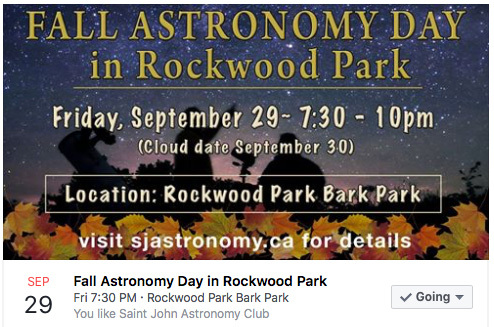 •If you need help with your telescope, experienced amateur astronomers will be available to assist you at the Telescope Clinic during Saturday afternoon. 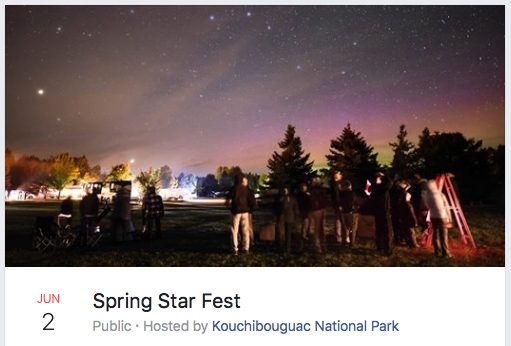 •The observing site will be in the field near campsite #194, in Loop #3 of the South Kouchibouguac campground. Preceding the evening observation sessions, there will be a presentation at the kitchen shelter across campsite #200, where you can learn about the celestial wonders that can be observed that evening. •Several telescopes will be set-up on Friday and Saturday nights, to allow the public to view the wonders of the night sky. Weather permitting, we’ll be able to see the planets Saturn and Mars, as well as various star clusters, galaxies, and nebulae. 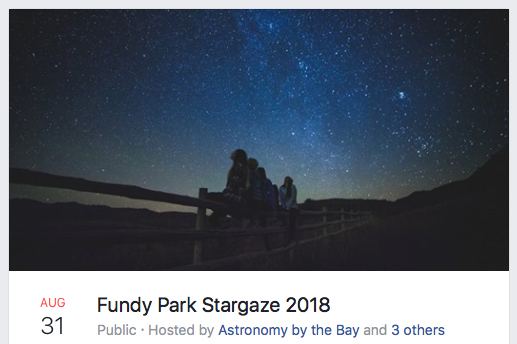 •Preceding the evening observation sessions, there will be a presentation where you can learn about the night sky wonders that can be observed that evening (location to be determined). •During Saturday afternoon, drop by to take a close-up view of the sun through our safe solar-filtered telescopes. 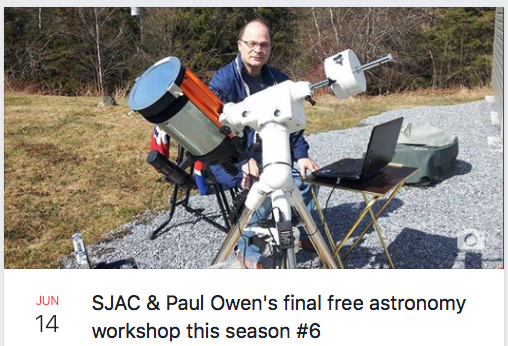 Bring along your telescope for a free set and tuning. If you need instructions on operation, there will be amateur astronomers on hand to guide you through the use and set-up of your telescope. 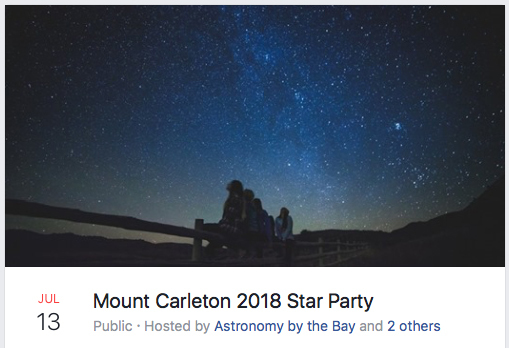 One of our astrophotographers will be there to show you how to take pictures of the Milky Way with your camera, and to answer any questions related to photographing the night sky. There will even be instructions on using your smart phone to snap pics through your telescope. 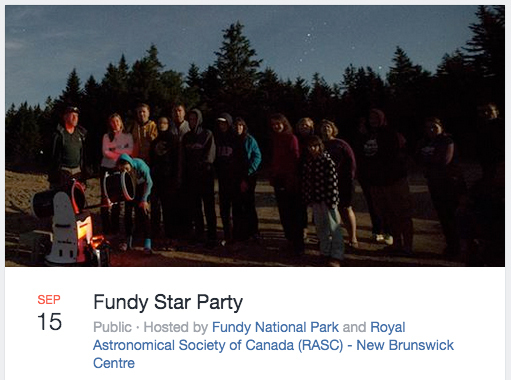 Come join members of the Royal Astronomical Society of Canada for our annual Camping and Observing Weekend (C.O.W.) at the Mactaquac Provincial Park. This year’s C.O.W. lands on the same weekend as the Perseid meteor shower, which peaks on the night of Sunday, August 12th. The Perseids will also appear during the nights preceding and following the peak, but at a lesser rate. Activities take place in the Armstrong Campground, near site 44. 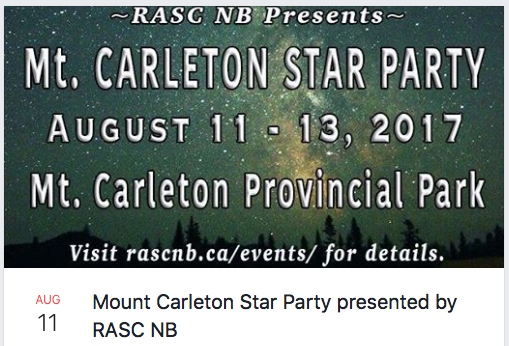 See our Page for more info and RASC NB Schedule of Events & Map. 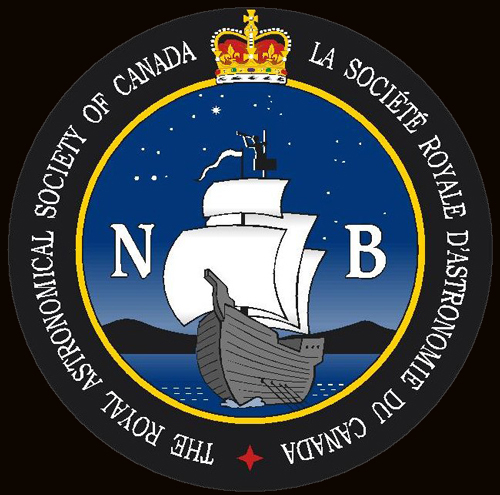 Join local members and guests of the Royal Astronomical Society of Canada for a telescopic trip to the planets. See Venus half lit up like the Moon, Jupiter’s cloud belts and four Galilean moons, Saturn’s spectacular rings, and Mars at its closest in 15 years. Not to be outdone, the Moon puts its craters and Straight Wall on display for the 49th anniversary of its first visitation by humans. -For overflow and people with mobility issues please use the lot near the Squirrel BBQ . **The astronomers park in the upper section above the kiosk where they will set up their equipment. -Then meet at the upper parking lot (above Kiosk) near Squirrel BBQ. Don’t forget to bring a mug for hot chocolate. If it is cloudy we will try again on Saturday, July 21. All tours are provided free of charge by J.D. Irving, Limited. If you have any questions please contact us at the park at 653-7367, naturepark@jdirving.com or through Facebook. 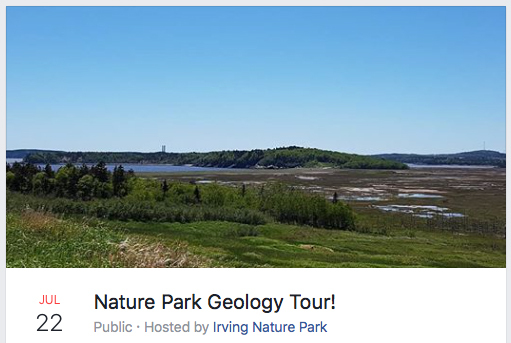 Where: Irving Nature Park~meet at the Barn, 1379 Sand Cove Rd. 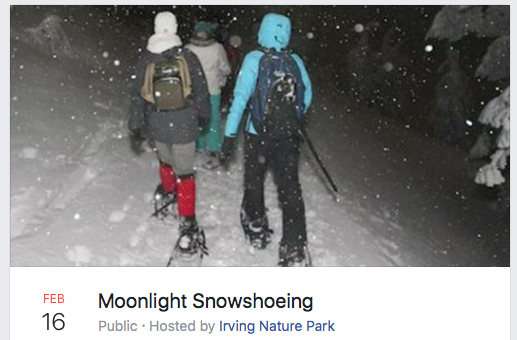 Description: Depending on snow depths, we will either walk or snowshoe out to Sheldon Point, taking time to stop and discuss the winter constellations and the stories behind them. 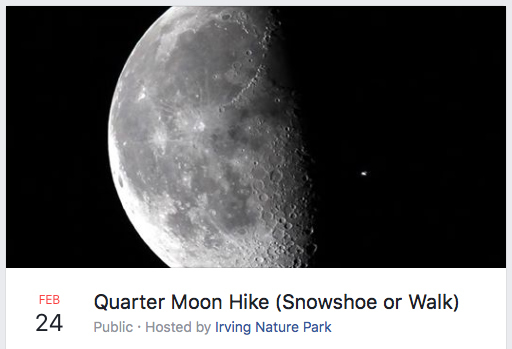 As this is only a quarter moon, we will likely need headlamps/flashlights through some sections of trail, but this dimmer moonlight will also afford great viewing of the moons surface, especially along the shadow line. 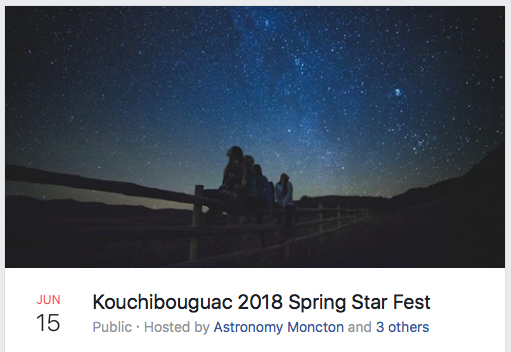 Members of the Saint John Astronomy Club will be there with their scopes to provide incredible imagery of some of the celestial objects gracing our winter sky such as: Orion Nebula , Pleiades (The 7 Sisters), The Dog Star, and more. Bring a mug for free hot chocolate after the hike. Don’t forget your snowshoes or perhaps “Ice Grippers” depending on conditions. 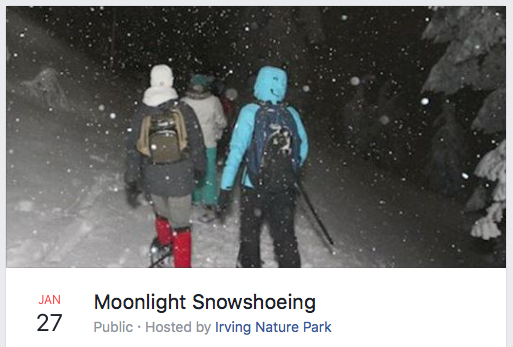 Check our Facebook page for trail conditions just prior to the event. 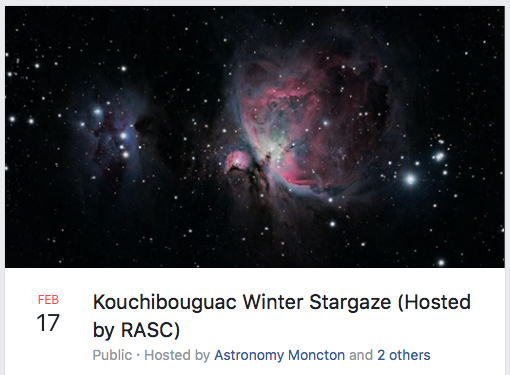 Website: Please check the RASC.NB Event Page for more info. 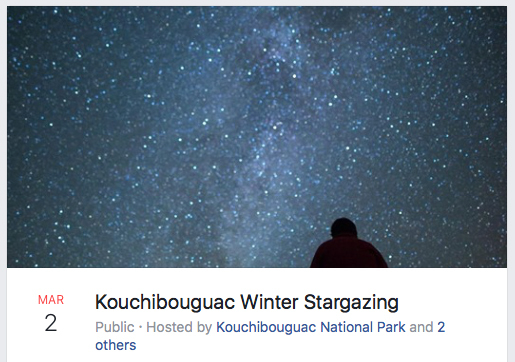 Join members of the Royal Astronomical Society of Canada for an evening under the winter constellations at Kouchibouguac National Park. Weather permitting, this will be a great opportunity to observe the magnificent Orion Nebula, as well as several other star clusters and galaxies. Members of RASC and their associates will have several telescopes that the public can look through. 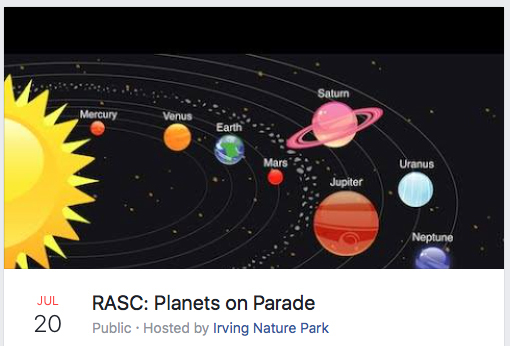 This event is free and open to everyone, however, a pass will be required for entry into the park (except for volunteers with telescopes). Please park at the Pijeboogwek parking lot and make your way to the visitor center parking lot, where the lights will be shut off to give us an unimpeded view of the winter skies. 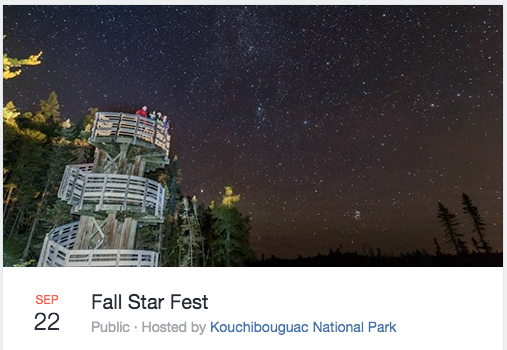 Please check out the Kouchibouguac National Park website for information on how to obtain a park permit. The Pijeboogwek Waxing Shelter should be open until 8PM that evening, so you can purchase a permit there if necessary. An aerial view showing the locations for parking and observing is posted here. May try again in February. When: Event is past, but video is now posted. Got an eager future astronomer on your Christmas list? Perhaps you’re thinking of just spoiling yourself. Whatever the reason for looking for an astronomy gift, I’d like to offer some information to help you make your choice. 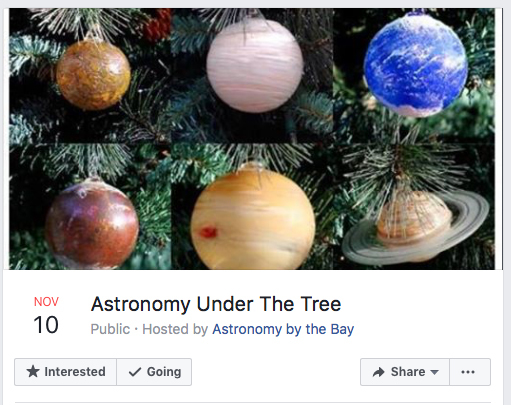 Please tune in to a special one hour Facebook Live broadcast on Friday, November 10 at 8pm as I offer some options for astronomy presents under the tree. We’ll look at books, subscriptions, binoculars, telescopes, accessories and more. Registration: Type “Attending” in the comment section at the bottom of Webpage or contact the host Paul Owen . Registration: Course is full. Registration is now closed, sorry. Exhibit runs till October 28. 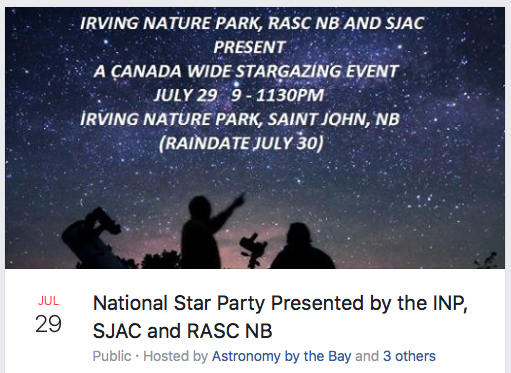 Itinerary and details: Please visit RASC.NB. Were you there? Lots of pics on our page. Cancelled due to poor forecast. When: Cancelled due to poor forecast. It is unlikely now that the event can be rescheduled with the many Fall events already planned. Website (with lots of pics): National Star Party at Irving Nature Park. Website (with links to the various presentations): Free Astronomy Workshops. 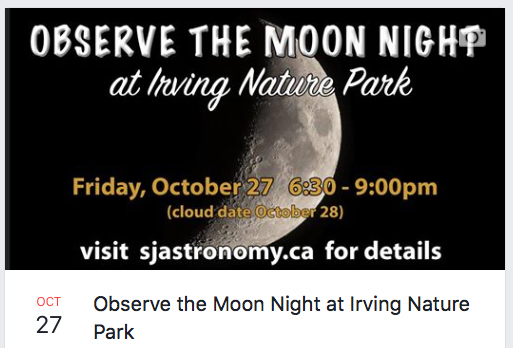 Please Note: If you do not have a telescope, but would like to check out the Stars, Planets, and other celestial wonders, Chris Curwin from Astronomy by the Bay is usually at Saints Rest Beach by Irving Nature Park on many clear evenings. 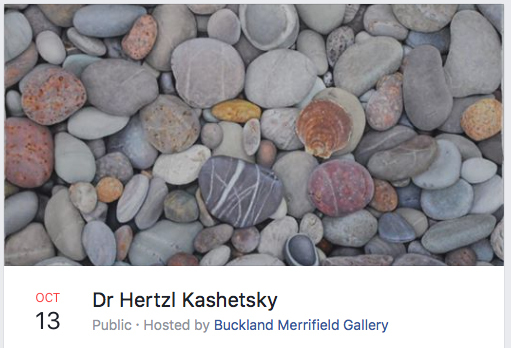 He posts on his FB page when he is going to be there, and is often joined by other astronomers. You can even take a pic with your phone through his telescope.